Indiana State University graduate student Ethan Rath and undergraduate Hunter Gill are combining their efforts like chemicals in a compound as they look for new mixtures to clean the surface of meat in preparation for packaging and shipping. The colleagues have delivered one published model of E. coli and are currently working on salmonella and listeria. Rath, a second-year graduate student studying bioinformatics, uses the software QSARINS, which takes the structurally information of molecules and breaks it up into data that can be used in a predictive test, to determine relative biological effects. "It is a good method for saving a lot of money and time with compounds that just won't work to begin with," Rath said. "We do have results, but we are still working on what they mean. We do have some general ideas on what seems to be functionally feasible for these chemicals and some good ideas for what these structures mean for the industry. We want something different but something that works from current chemicals being used." Their advisor, Yongsheng Bai, approached Rath earlier this year with the question of what could they do with computational techniques. Rath then spent seven months working on the methods, which will turn into his thesis work for his master's degree. Gill, a Rural Health Scholar, works under Rath, who serves as his mentor. They spent last summer developing techniques and proper ways to conduct their research. Once they had discovered the best group, Gill sent them to Rath, who made the consensus model outline, used to figure out the top compounds that they thought would be most effective against the pathogens. This fall, Gill did more data collection and is wrapping up edits on the manuscript with the hopes it will go onto a peer review. Now, Rath is writing and analyzing the data. In the future, Rath and Gill would like to purchase or synthesize some of their best compounds for each bacteria species and test them in a lab and in an environment that they have predicted is preferred for that bacteria species to help them with accuracy for QSAR models. Last summer, Gill collected data through different online databases as a part of a research project. Looking at the use of computational method to assess the ethnicity of different compounds. 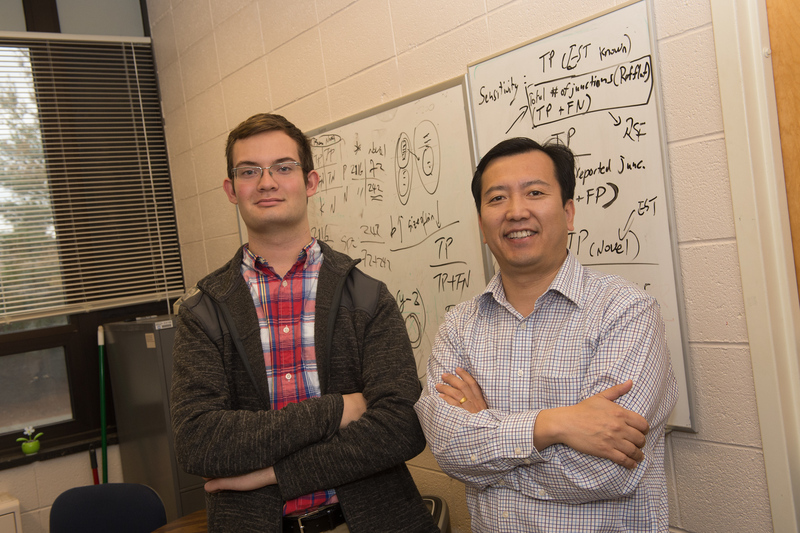 "My research and education at ISU is to further my knowledge of computers and how to use bioinformatics tools and potentially to develop them in the future," said Gill, who wants to continue doing undergraduate research as he pursues medical school. He's also considering getting a doctorate in chemistry. "My past and current research is really developing my commutation skills and bioinformatics in the future of biology," he said. "Working with Ethan has been pretty instructive. But, honestly, this project dealt with computers just as much as chemistry. Coming into the lab, I didn't know a lot about computers or different software. Ethan was patient and helpful with me as I learned how to learn QSAR and other programs. He is really hardworking and added a lot with the publication." Once Rath finishes the project, he will start writing his thesis and a couple grant applications. He then will turn his attention to applying to the University of Chicago's doctorate program and hope to land a job in industry or government research looking at complex systems for genetic diseases, like cancer. "So in undergrad research everything is made-to-work," Rath said. "For graduate research, it is completely different, and you are building a research project from the ground up. It is a struggle. It is a lot of throwing yourself against the wall until the wall falls down. The way I put it is: there is a lot of failure - until you get that one success. But that one success is the best feeling in the world. That moment you finally figure it out, the moment you finally get something is indescribable." Photo: https://photos.smugmug.com/Other/Media-Services/Media-Arts-and-Sciences/Hunter-Gill/i-Xnfpbfp/0/X3/November%2018%2C%202016%20Hunter%20Gill%208760-X3.jpg -- Hunter Gill and Yongsheng Bai pose for a photograph. Grad-undergrad student duo are researching new mixtures to clean the surface of meat in preparation for packaging and shipping.